Digital parenting: Do we need tech to ​raise kids in the wearable age? Children are next on the wearable agenda. We can measure them, just like we measure ourselves with fitness trackers. We can monitor them, just as we can any item in our smart home. We can track them, just as we can track anything that belongs to us. We can even connect them to the internet so that we can watch them wherever we are. All this is easy, but the question is: should we? Mankind has got on pretty well at raising children in the thousands of years since we've been walking the Earth. So, are the smart nurseries and pre-teen tracker bands of today really doing anything for us as parents or are they getting in the way of the most natural process there is? Child psychologist and parenting expert Dr Claire Halsey errs on the side of switching off. "Children are so precious, so loved and so important that, of course, we're always thinking of new ways to keep them safe but it's made us information greedy and perhaps over-vigilant," she told Wareable. Until the age the quantified self arrived, the technology keeping its eyes on your infant was fairly limited. There were audio and video monitors so that you could hear and see what was going on while baby was down - and ideally sleeping - but that was about it. Now there are wearable devices offering heart rate, body temperature, respiratory rates and information on location and body position all continuously measured and graphically presented on a companion app wherever you are. That's suddenly an awful lot more for parents to sift through and possibly even worry about according to Dr Halsey. "We're interpreting this data with safety in mind every time and we might quickly jump to the conclusion that there's a problem when perhaps there's not. So, it has made us extremely alert to anything that could go wrong and all that over-anxious hovering, we transmit it. We have the potential to create that anxiety in the child when they grow older." The facts of the matter are that the rates of post-neonatal mortality - the death of children between the ages of four weeks and one year - are incredibly low. Advances in healthcare have seen the figures drop below two infant deaths per thousand (0.2%) in the UK since the early 90s, long before the connected revolution, and that's incredibly low odds in anyone's book. Perversely, that makes tragic incidents all the rarer and therefore far more newsworthy. The result, is a fear culture that could be a key ingredient in driving the sales of a child wearable industry as far as it wants to go. "I think we're more anxious than we were," agrees Dr Halsey. "Roads are much busier, cars are faster; there are risks out there and we certainly know about them more than we used to. "Mostly, I don't think it's a matter of need. We like it. We like technology. We like being connected that way. We've changed our social lives to involve it. We can become so wedded to the technology that when we're with our child we're actually watching them on the phone." As a generation of people who are used to turning to technology to solve our problems, it's easy to see how the anxieties of parenting - where there is always debate and few objectively right ways to do things - have invited the wave of child wearables that we're seeing at the moment. However, something about the nature of raising children that has also changed to warrant this penchant for peace of mind. At the outset, we tend to live more as nuclear family households than we have done throughout human social history. Whether it's the tribal living of hundreds of years ago or having your mum and dad down the road, far fewer new parents have that support from their relatives who've been through it all before. There's less relief from duty and not so much good advice and experience to rely on. Small wonder that we're taking the opportunity with both hands now that technology has stepped up to help fill the gap. And, of course, it's more complicated still when you consider the one in four UK families with single parents as well as those where the arrangements come with their own unique complications. Solving these new family needs is what companies like Mimo are looking to do according to its chief operations officer Mike Gutner. 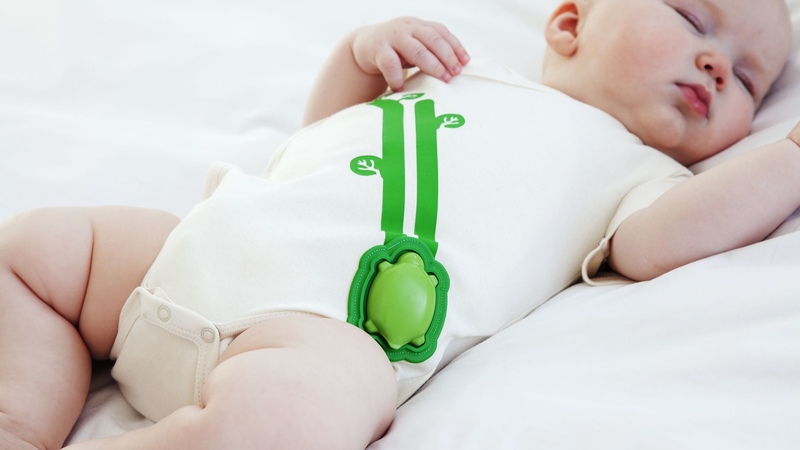 Mimo is a smart baby grow with a wearable sensor, shaped like a turtle, built in. Originally designed as a sleep device for adults, the Turtle now monitors sleep activity, respiration rates and body position and beams it all back to your Android or iOS device as well as listening in to the audio too. It's the baby monitor reimagined. "I think this explosion of wearables for children goes beyond want - certainly for Mimo. Parents are needing connect to each other in new ways as parenting is changing, and as parenting becomes more dual, and more mum-and-dad-together. This generation likes to share more, they're online more and they're used to making decisions online more too." "There's also a higher percentage of single dads, a higher percentage of dads who stay at home; you've got wonderful shifts in parents wanting to work together more. So, there's now a greater need for everyone to stay on the same page. That's what Mimo is solving for. Part of it is satisfying a need but another is satisfying a desire for parents who want to know more." According to Gutner, though, those buying for the desire aren't necessarily doing so purely for an over-anxious quest for peace of mind. The dream of all wearable devices right now is to turn all the reams of data they gather into useful, condensed coaching and advice. That's the same goal for Mimo and the rest of the child-targeted tech. "Going forward, what we're doing is starting to translate the data into actual insights and suggestions on how to improve and keep baby sleeping. Sleep training, for example, can be a harrowing experience for parents, so being able to understand how that process is going is really important. It's a matter of providing the right information and the right time and in the right way." So, as a surrogate to that family wisdom that used to be passed down and as a way to meet the demands of more complicated family structure, wearables make plenty of sense. When it boils down to it, though, the parents for whom these devices fall into this category of necessity are still a minority. Plenty of people will buy smart monitors, baby Fitbits and location trackers either because they simply like the tech, they have money to throw at problems or because they're searching for a sense of control which they'll probably never have. The only harm done is to the tranche of more anxious parents - and their children - into whose trembling neuroses these devices will unfortunately play. In my personal experience as a father of a two-year-old and a five-year-old, I'd trade any of the new wave for a digital in-ear thermometer and the Calpol on standby for when a fever kicks in. Even if you're a wearable junky like me, it's important to know when to switch off and let nature do what it does best. Still, perhaps that's easy to say when your wife is a child psychologist and a specialist in sleep.